Several Iranian religious and political figures have gathered to discuss the plots hatched by enemies to make inroads into Iran, particularly after the recent nuclear deal. Iranian officials have been repeatedly warned by the Leader of the Islamic Revolution Ayatollah Seyyed Ali Khamenei about the issue of ‘infiltration’. In a meeting entitled “Islamic Revolution and Avoiding the Danger of Infiltration”, several religious and political figures exchanged ideas about the concept of infiltration during the decades after the victory of the Islamic Revolution. A book titled “A study on the current of infiltration in revolutions” was also unveiled during this meeting, which was held on November 1 in Tehran. Ali Saeedi, the Leader’s representative in Islamic Revolution Guards Corps (IRGC), is the author of the book unveiled in this meeting. In the introduction of the book, Saeedi elaborates on the concept of infiltration and its impact on the failure of big revolutions throughout the history. 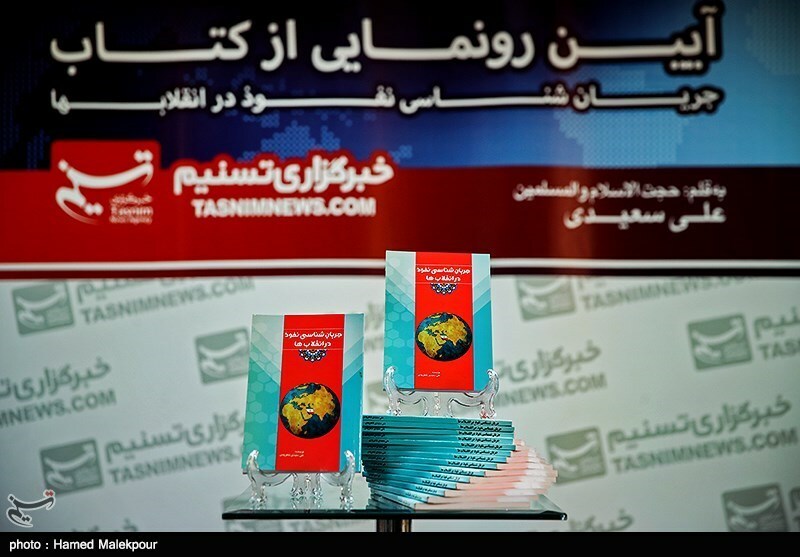 It starts with a study on the current of infiltration in a number of revolutions including the Revolution of Prophet Moses, that of Prophet Muhammad, the Persian Constitutional Revolution, the National Movement of the Iranian Constitutional Revolution, the Nationalization of Iranian Oil Industry, the Russian Revolution, and the 1979 Islamic Revolution. The author has tried to raise political issues of the day in a bid to help the reader grasp a better understanding of the current situation and the concept of infiltration. 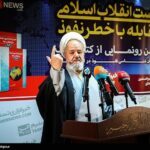 In another part of the book, Saeedi describes the role of the Leader and Guardianship of the Islamic Jurist [Velayat-e Faqih] in foiling the moves to liberalize the country. 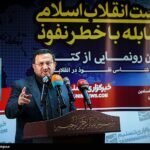 Saeedi referred to the infiltration as the most dire threat against the Islamic Revolution. He stressed that Iran is the most strategic country in the world for the US to transform its culture. Saeedi noted that despite the Leader’s stern stance against the cancerous tumour of the US, some officials have unfortunately brought this tumour within our borders. Elsewhere in the meeting, Heidar Moslehi, a former minister of intelligence, stressed that the enemy is trying to interfere in the calculations of our nation, elites and officials in an attempt to impose their own views on their enemies. “The enemy is trying to goad people into making mistakes in their choices in the coming presidential elections,” he warned. 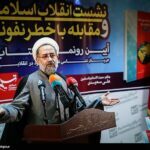 Moslehi also expressed regret over the remarks made by Mohammad Javad Zarif, Iranian Minister of Foreign Affairs, who said the US can destroy our defence equipment at the push of a button. “In the past, we were faced with physical and security types of infiltration which resulted in the bloody bombings of June 28, 1981 and August 30, 1981,” he noted, adding that such infiltration had a tactical aspect with the aim of removing government officials.